Before you know it, a wormhole appears right next to the Federation base. From the wormhole appears ships bearing insignia of the likes you've never seen. One of them races towards the base after annihilating two other strange looking ships and crashes lands on the base. Upon prying open the doors of the ship you find no survivors. Knowing that everything happens for a reason, you assume command of the ship as it will make a valuable addition to your fleet. The Starfighter variant starts with a Burst Laser Mark II and a Heavy Ion, along with Mind Control but only has level 1 sensors, which are quite out of the way. Starfighter's crew consists of Federation allies. 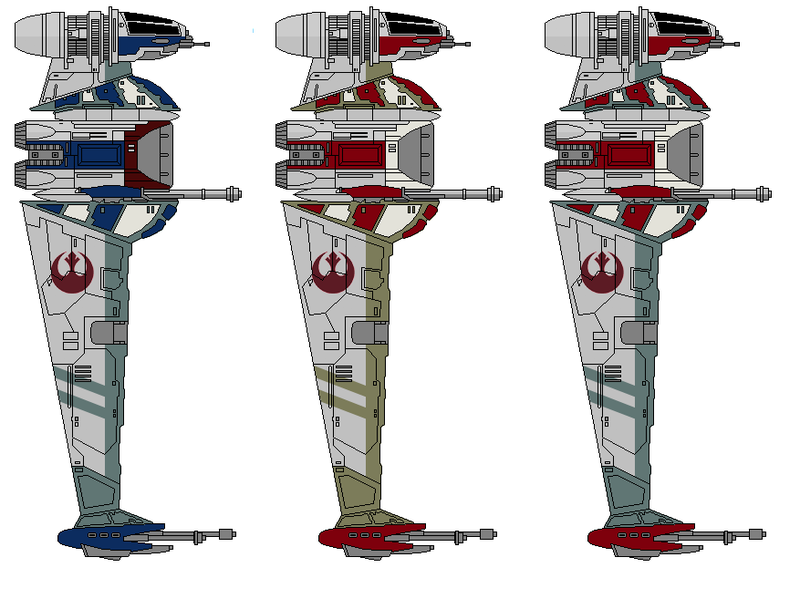 The Starcruiser variant is the Starfighter variant with a complete makeover. It starts with a Chain Laser and an Anti-Bio Beam, looking for crew kills similar to the Slug A. Its systems are spread out, but not in the usual manner, as the order is all jumbled up. However, it lacks a functioning shield system and relies on its funky drones for defense. Starcruiser's crew is diversified. All in all, Starcruiser is more different from Starfighter than it is similar. The Starstealth variant has all its starting systems tightly packed to the top of the ship. However, getting boarded becomes a run for the doors system which is away from the rest. It lacks a shield system altogether, but makes up for it with its interesting weapons and Cloaking unit, along with a bit better starting engines. Starstealth is spread thin -- its crew is small and are opposites, but because of this, are better equipped for disaster. This variant has a similar theme as the Stealth B, but its execution is different. - fixed not being able to use hacking on the type A, the Starfighter. had to make the right airlock room bigger to compensate. - made all the mounts visible. figured people like looking at weapons. also, previously the first two weapon mounts were at the bottom of the ship, which can't even be seen. - works like regular anti-drone, same power req. - added 1 more power as a result of defense 3's power req. - ship description "galactic empire" changed to "Galactic Empire"
Currently the ships don't have any gibs; have not delved into splicing yet. Last edited by mr_easy_money on Mon Jan 22, 2018 9:46 pm, edited 24 times in total. First things first : Congrats on getting a first mod out. Whilst I'm not sure if this is the first ship you created or not. Welcome to the team. Something I often nitpick about is interior images clashing with doors. It's a little thing but it is noticeable. Like having food stuck between your teeth. Again, this is something I immediately notice and I have seen worse out there. And the manning stations are solid. Well, most of them, it seems like the engine manning station on the starcruiser is facing down rather then up. Creating those isn't hard as you can usually edit existing ones to fit your needs. A simple (and free) program like GIMP can go a long way. Keep in mind a single tile is 37x37 pixels I believe. Not sure if I'm just blind or something along the lines, but if you don't have weapon mounts, you'll end up with weapons flying in the top left corner. Again, haven't tried them out so I can't say if this is going to be an issue or not. Some of these are odd... not bad, just odd. It's probably just my mind set but I (again personally) feel like systems and weapons should go hand in hand. I find it odd that a ship which is supposed to be a gunship ( so relying on weapons) is given a mindcontrol system unless there's a background story to go along with it as it seems like a powerful starting combination. You're hearing this from the guy who created a federation medevac that didn't start with a medbay or clonebay so... had a nifty artillery though. The starcuiser seems to be having the opposite problem. No proper way to defend it self. A Def I doesn't stop lasers or beams and killing crew with a bio beam is often a long process. The Chain laser is a good weapon, but remember, it takes 14 (?) seconds to fire its first shots and 1 hit on weapons isn't going to take them all out most of the time. Keep in mind that a 2nd shield bar is 100 scrap away. Maybe add a repair arm rather than the Emergency respirators ? People tend not to like them, but you'd be forced to use it here. The third one looks fine. Maybe a bit OP with 4 shots at the start, not sure, but I like how you actually gave it stealth weapons. Something that I was slightly bothered about that the stealth A/B didn't have. Finally, gibs : Making them isn't usually that hard. Just cut the hull image up and you can cut the "edges" of other gibs and stick them on the "seams" of your gibs. Glad you did spend some time on these. Which you can tell by the fact that your interior images are for the correct system and correct room size. Also, and I'm not sure, congrats on not using superluminal which I'm solely basing on the fact that you have non-standard room sizes. If you're not planning on using irregular room sizes (so anything but 2x2, 1x2 and 2x1) it might be easier to use that program as it's like Dos vs. Windows. Good first mod. Good luck on potential updates, and happy modding ! Don't suggest that! Even if it is viable in early sectors, I'd rather have all the Scrap I can get to acquire shields. Especially if you find a whole lot of empty beacons and very little damaging combat before your first store (so I can sell that augment). Why not Rock Plating or Titanium System Casing? That way you have a chance not to lose everything when hit. yeah, I'm not really sure why I even have that on there ( it doesn't really make any sense as you said ) and also because mindcontrol only works if you have manned sensors before using them. I guess I just put that on there in the excitement of creating a ship. I dunno, I guess I'll think of some way to incorporate that with a background or replace/remove it. I was thinking of changing them to dual lasers but then you said this so is it just fine with that or should I change it? not really sure what you mean by this; do you just cut up the ship and those are your gibs? and what about making it look cooler in regard to gibs themselves such as the broken interior of the ship (e.g. vanilla FTL ship gibs) ? Which you can tell by the fact that your interior images are for the correct system and correct room size. stylesrj wrote: Why not Rock Plating or Titanium System Casing? That way you have a chance not to lose everything when hit. Interesting idea. Do you think I should swap out the emergency respirators AND the drone for Rock Plating/Titanium Casing or just the emergency respirators. Considering the ship only has 1 bar of power in the shields, it'd be a bad idea to remove the drone. The Zoltan B works in that it has a 5HP shield at the start of each battle so you have some leeway. 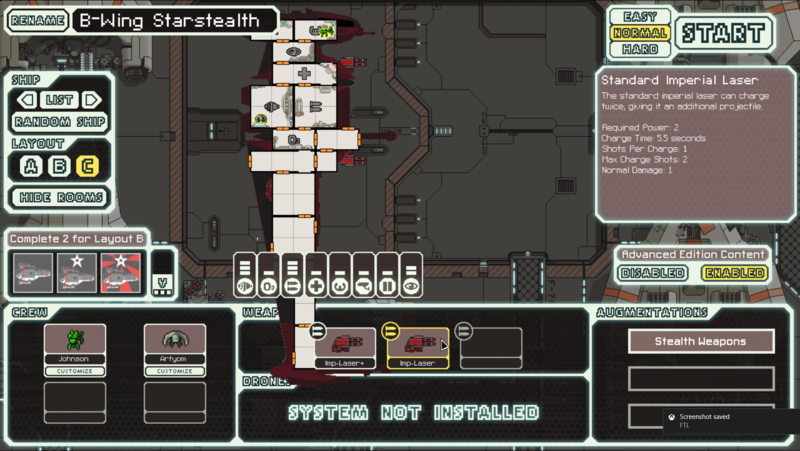 The Stealth Cruisers have cloaking or a Zoltan shield, so there's leeway there to avoid damage. 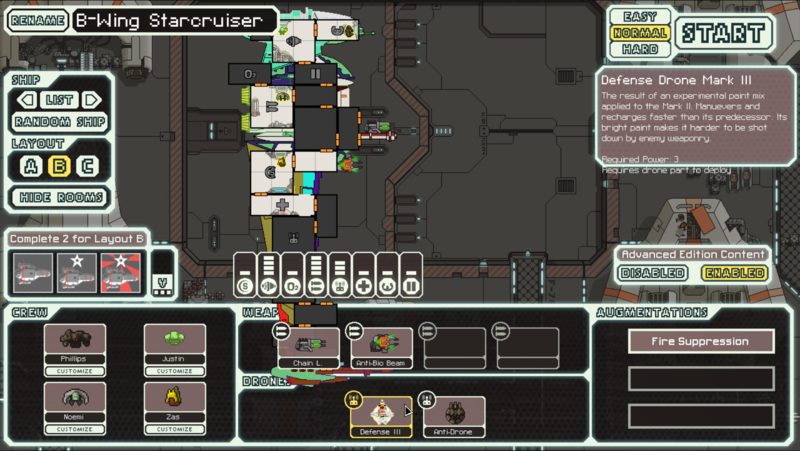 A ship with no defense drone, no cloak and no Zoltan shield and only 1 bar in Shields is just asking for a quick defeat. What you could do is make a MK.III Defense Drone or something - fires every few seconds but it can intercept everything and only uses 2 bars of power. Captain's Edition (annoyingly) has those sorts of drones. As for Emergency Respirators, I can't see what it's doing on a shieldless ship. It doesn't make much sense, even if TIE pilots had them. Creating a story behind some ships can make a lot of oddities seem normal. Doesn't have to be long or anything. And the story itself is naturally up to you. If you can find a way to make them fit together as a good starting pair, you're good. What you could do is maybe go for 2 charge lasers (the ones with a max of 2 shots). Still a 4 shot barrage, but a longer cooldown. And once shields are down, you can switch to a faster 2 shot barrage by only charging one shot on each. Again, these are only idea, so the choice lies with you. You could always try your hand on custom weaponry. For the gibs, that's indeed what I meant. Cut the hull image in X-amount of pieces (usually between 4-6 but I think with these, you might get away with 3-4) and you have the start of your gibs. Then get an existing gib from a ship and you can use those to cut of the broken interion. Then with some editing you can add it to your bits. A bit of work, but having gibs is always good for some extra points. For superluminal. No... you can't, creating a lot of irregular room sizes, especially when you cross the 4 tile amount for a room, makes it very likely your ship will crash the game when you load it up in the hangar. Seems like less than 4 tiles is ok.
For the entire repair arm/rock plating debate : Indeed, the repair is still considered the worst augment in the game. Whether it is due to people not knowing it doesn't use scrap when at full hull (anymore ?) or not doesn't matter. Remember that there is always the option to lower the percentage of scrap the repair arm takes. System casing isn't an option as it isn't a way to defend against hull damage. An idea that does work however, is the same defense I used on my Xanthoconite (Crystal ship), and that is rather than making use of shields or cloak, is making use of a defense drone mark II. And it works surprisingly well, even with a big layout like those on a crystal ship. You'd ill be screwed against drones, so you might want to consider adding an anti-combat drone like on the Simo-H. Which is what I ended up doing as well, making it so you couldn't use both at the same time. So long as the room has only 4 sides, it's OK. I've made ships with 8-tile rooms (2x4) in order to cram as many Zoltan as possible into one room on a ship. It will always have only 4 sides. I think it's more like when you start doing like 10x1 or something rooms. 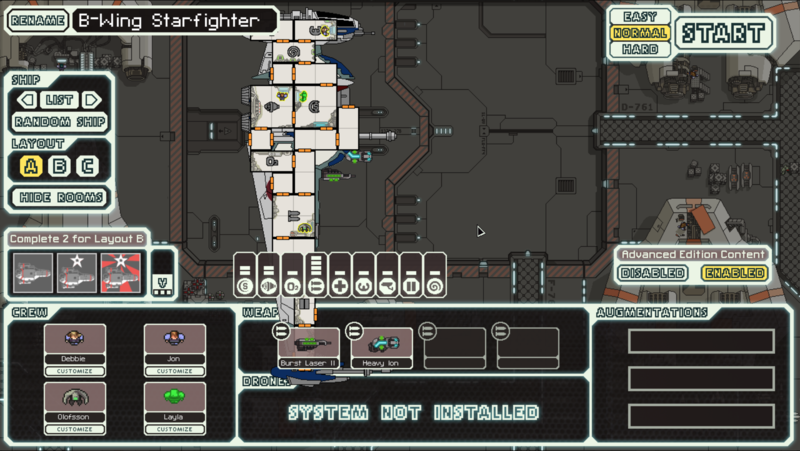 Ships have caused FTL to crash on the hanger just for having irregular rooms.